The beautiful town of Collioure has several churches, the smallest of which is the Chapelle Saint-Vincent. Built around 1700, it’s located on a narrow spit of land that reaches into the bay. During the day, it always seemed to be mobbed with people checking it out, so I grabbed a photo of it very early one morning as the sun came up. 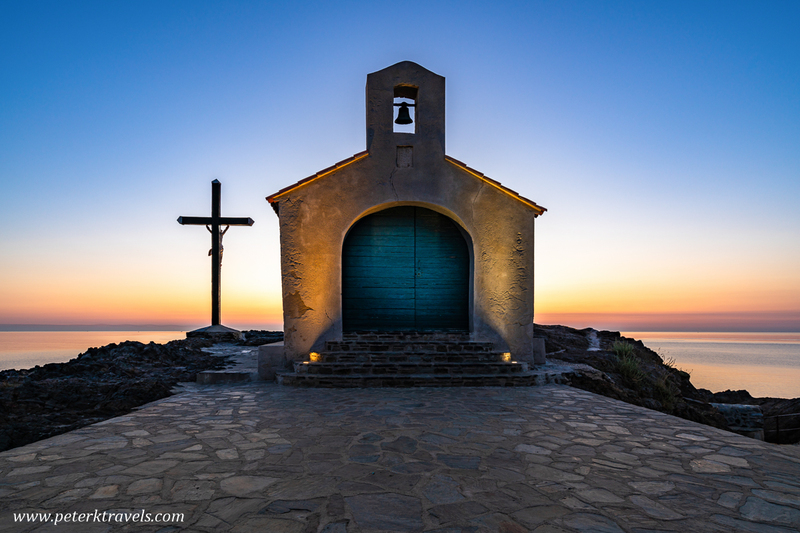 2 Responses to "Chapelle Saint-Vincent, Collioure"
Thank you for sharing your photos. They are always inspiring! I’m convinced that I need to start getting up earlier every day, since you have so many exquisite early morning photos. I saw in another photo that Christ faces the sea on the crucifix. That’s interesting. Are you a photographer as well? I am more of a morning person, so it’s usually not too hard for me to be out before the sun is up. In addition to great light, there are usually few people around. I have noticed that in some countries, though, they turn off lights on monuments or attractions during the night, so morning shots may not be as well lit as evening shots.